Philosophical interest in the topic of disagreement has mushroomed in the past couple of decades. Philosophers want to know whether, and how, a rational person should change or not change her beliefs, when discovering that someone disagrees with her on a certain matter. 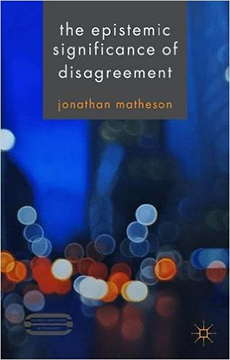 Matheson’s book is a well-written and thorough review of the recent literature that has dealt with the problem of epistemic disagreement, as well as a compelling argumentative monograph in support of one of the conciliatory stances that has been proposed in the literature dealing with epistemic disagreement. The book covers the two most prominent stances that are currently dominating the literature: the conciliatory stance and the steadfast stance. The two stances are actually families of possibly rational positions that one can take in a situation of disagreement, and Matheson defends a specific conciliatory position called the “split-the-difference view”. After introducing the topic, the book outlines the concept of idealized disagreement. This is a situation in which two epistemic peers find out about their disagreement over a matter on which they are epistemic peers, where “epistemic peers” can be defined as epistemic agents who are equally likely to be wrong on a certain matter. Because of the high number of factors that can potentially affect the situation—the peers could have access to different evidence, one of them could be momentarily impaired, etc.—the strategy Matheson adopts is to formulate in detail an idealized situation of disagreement, argue what is and what is not rational to do in that situation, and, finally, de-idealize the situation of disagreement to argue how the split-the-difference view is applied to everyday disagreements. The strategy of idealization makes sense: Dealing with all the potential factors affecting a situation of disagreement, without idealization, would make a single rational response to disagreement difficult to argue for or against. It is possible that the widespread disagreement about disagreement—i.e. philosophical disagreement about how to respond to disagreement—is a result of the failure to define the problem clearly or at least unanimously. It remains to be seen whether the idealization that Matheson adopts is one that can be widely agreed on in the epistemology literature. A more concerning worry, however, is how such idealization operates. Idealizations are common in laboratory or model-based science, and de-idealizing is often a rather difficult non-linear process. I discuss here one of the idealizations that Matheson’s uses, the definition of epistemic peers as epistemic agents that are “in equally good epistemic position regarding [the matter of disagreement at the time of disagreement]” (24). Elsewhere, epistemic peers are described as individuals who are “equally likely to get a matter right” (104). The definition is not new; in fact, it is widely used in the literature (see Elga 2007, Lam 2011, and King 2011). The issue with the definition is that it seems to put the cart before the horse, as it were, and as a result, it is not easy to understand how such idealization can be eliminated when we are going from idealized disagreement to everyday disagreements. Defining epistemic peers as individuals who, roughly, are in the same equally good epistemic position can take at least two meanings. On the one hand, it can mean that two epistemic peers are equally likely to get the matter right; on the other hand, it can mean that the two peers share roughly the same epistemic credentials. The former is the meaning usually adopted in most epistemological literature, and the one Matheson uses. But the likelihood of getting the matter right should be a consequence of starting from roughly the same epistemic credentials. It is because we share the same or similar epistemic credentials that we are (probably) equally likely to get the matter right, not vice-versa. We should not, then, postulate that two epistemic peers are, by definition, equally likely to get matters right, since being equally likely to get the matter right would be a consequence of being epistemic peers, if other confounders do not get in the way. The analogy with the way we compare thermometers helps, and I use this analogy because Matheson himself rightly uses it in this book, when discussing conciliatory views on disagreement (70). Imagine we had to decide whether thermometers are “instrumental peers”. We want to decide, in other words, whether the two thermometers we are using to check the temperature should be judged as equally reliable ones. We want to eliminate the possibility that one thermometer is stuck on a certain temperature reading, or that one of them is using a different scale from the other, for example. How should we define “instrumental peers”? We should not define them as “instruments having the same likelihood to get the temperature right”; that would be, again, like putting the cart before the horse. It is in virtue of the making of the two thermometers, their similar quality, the absence of defects, and so on, that we are justifiably entitled to claim that they are equally likely to be “instrumental peers”. Moving back to epistemic disagreement, if we define epistemic peers as individuals who are equally likely to get things right, we are idealizing too much. How to move away from that idealization is something that ought to be spelled out when going from idealized to everyday disagreements. However, it is probably even better to just do away with that kind of idealization altogether, and to define epistemic peers in light of their being equally qualified to judge on the matter, their possessing very similar bodies of evidence, their being free from temporary cognitive impairments, or other tangible characteristics that epistemic peers share. Matheson’s book provides a very convincing and accurate analysis of the current situation in epistemology of disagreement. He analyses the several stances defending the steadfast view, which requires that epistemic agents hold steadfast in their beliefs when they find themselves in disagreement with epistemic peers over the same beliefs. Matheson finds the steadfast view wanting, and provides a defense of the conciliatory view instead, and of the split-the-difference view in particular. He also reviews several of the critiques that have been leveled against the conciliatory stance and the split-the-difference view, and provides a defense for the conciliatory stance against each of them. A general critical note is that Matheson does not provide a direct analysis of the rationality of the equal-weight-view, the category under which the split-the-difference view falls, nor of the split-the-difference view itself. The question one would expect to see analyzed is whether it is rational to split the difference. Jehle and Fitelson (2012) have shown that there are problems with the equal weight view conceived as linear updating. In particular, straight averaging rules seem to be incompatible with a Bayesian perspective. That’s not enough to say that the equal weight view is irrational, because not every scholar agrees the principles of Bayesian rationality, but it is important to address possible concerns about the rationality of the equal weight view. I will mention such a possible concern in concluding this review. Let us imagine that two epistemic peers, however defined, are disagreeing about the probability of rain tomorrow in a certain location. One of them states that the probability is .6, while the other states that the probability is .8. It so happens that the two peers happen to be professional forecasters; they know that different models give slightly different forecasts, and that evidence can be interpreted differently by different forecasters. However, they are both known to be very professional forecasters, who have shared the evidence available, are not temporarily cognitively impaired, and therefore take each other to be epistemic peers. The split-the-difference view mandates that the two forecasters should agree to split the difference, and to agree on the belief that “the probability of rain tomorrow is .7”, because they are equally likely to be wrong in their initial belief. Since we are talking about probabilities, we should consider two possibilities: (a) we are talking about objective probabilities, and (b) we are talking about subjective probabilities. Let’s start from the latter: If we are talking about subjective probabilities, the epistemic peers should believe “the probability of rain tomorrow is x, but there is a 50% chance that I might be wrong”. From a probabilistic stance, it does not make sense to add a credence to a subjective probability. If I were to believe that there is a 50% chance of rain tomorrow, and that was a subjective probability, it would not make sense to add “but I might be wrong”. The definition of subjective probability implies that I might be wrong, and that is because assigning a subjective probability to rain is to assign a probability to an event which is deterministic, but the occurrence of which I cannot guarantee due to my limited knowledge. The weather forecasters have a subjective probability of either .6 or .8, but it would not make sense for them to split the difference on grounds that “I might be wrong (or right) with a 50% chance, and the same goes for my disagreeing party”. Let’s consider the case for objective probabilities: In the same weather forecasting situation, the forecasters now are dealing with the objective probability of rain tomorrow. One of them thinks that the probability is .6, and the other thinks that the probability is .8. Apparently, there is a disagreement, but that is not accurate in this situation. The two weather forecasters, being professionals, do not hold the simple belief that “the probability of rain is x”, where x is some number expressing the objective probability of rain. That belief would be too simple given the situation. It is instead more likely that professional weather forecasters would hold a more complex set of beliefs: (1) whatever the objective probability of rain is, it is some quantity x; (2) my model, data, and interpretation point me to a value of .6 (or .8) for x; (3) I know from experience and studies that an ensemble of well-calibrated models and estimations of the value of x is more likely to get closer to the true x than my individual estimation of the same value. One should see now that the epistemic situation of the weather forecasters is much more nuanced than it initially seems, and that the disagreement is only apparent disagreement. In the case of subjective probabilities, then, two individuals disagreeing on the probability of rain tomorrow might not be entitled to split the difference, because their subjective probability already takes into account the possibility of error. Does the actual fact that a peer disagrees increases the possibility of error? Although Matheson does mention how epistemic attitudes should change when we go from a possible disagreement to an actual disagreement (in Chapter 7, “Objections”), in the probabilistic case it would be odd to change one’s subjective probabilities on grounds of disagreement. In the case of objective probabilities, on the other hand, it may also be unjustified to split the difference because the disagreement is only apparent. Elga, Adam. “Reflection and Disagreement.” Noûs 41, no. 3 (2007): 478-502. Jehle, David, and Branden Fitelson. “What is the “Equal Weight View”?” Episteme 6, no. 3 (2009): 280-293. King, Nathan L. “Disagreement: What’s the Problem? or A Good Peer is Hard to Find.” Philosophy and Phenomenological Research 85, no. 2 (2012): 249-272. Lam, Barry. “On the Rationality of Belief-Invariance in Light of Peer Disagreement.” Philosophical Review 120, no. 2 (2011): 207-245. Matheson, Jonathan. The Epistemic Significance of Disagreement. London: Palgrave Macmillan, 2015.